Last night, David called us and told us the good news about the DC5 being inducted into the Rock and Roll Hall of Fame!!! Tonight, Margo Lewis, my agent from TCI in New York, called and congratulated me, and gave us all the details about when and where the induction will take place. This is something I have worked for all of my life, and to put it mildly, I am absolutely thrilled to death!!!!! Charlie and I are definitely already making plans for crossing the pond in March to receive my award, and we can't wait to see all of you again. David is coming over for dinner on Sunday and we will all celebrate the good news!!! I haven't spoken to the other boys yet but I can tell you that David and I are really honored, and thank everybody that voted for us. WOW WOW WOW! One has to wonder, under the circumstances, if JANN WENNER feels ANY sense of regret for last year's decision. A HUGE part of the focus in our 2007 ROCK AND ROLL HALL OF FAME Expose was the need to honor and recognize these deserving artists DURING their lifetime ... when they can be here to receive and appreciate this honor. Once again, our point hits home today. For ALL of THE DAVE CLARK FIVE Fans out there around the world, a sad, sad day in Rock And Roll History indeed. DAVE CLARK FIVE SINGER-SONGWRITER MIKE SMITH, R.I.P. 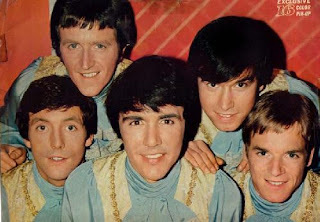 Mike Smith, the lead singer and keyboard player of The Dave Clark Five, one of the premier bands to emerge during the 1960's "British Invasion", died today from pneumonia at Stoke Mandeville Hospital outside of London. His devoted wife, Arlene, who is known as Charlie, was by his side. Smith was 64 years old.Smith, who was due to be inducted into the Rock 'n' Roll Hall of Fame with his band mates on Monday, March 10th, was admitted to the hospital's Intensive Care Unit yesterday morning with a chest infection, a complication from a spinal cord injury he sustained in September, 2003 that left him a tetraplegic (paralyzed below the ribcage with limited use of his upper body). Smith had been in the hospital since the accident, and was just released in December 2007 when he moved into a specially-prepared home near the hospital with his wife. Prior to his hospitalization yesterday, arrangements were being made to transport Smith to New York so he could personally attend the Hall of Fame Induction Ceremony. After his accident, Smith found tremendous support from his peers including Bruce Springsteen, Little Steven Van Zandt, and Peter Noone of Herman's Hermits, who helped defray his medical costs through donations and fundraisers. Long-time fan and "Late Show" bandleader, Paul Shaffer, helped organize a benefit concert in New York in August 2005, which featured many of Smith's fellow "British Invasion" stars, including The Zombies and Peter & Gordon. A DVD of the benefit, Paul Shaffer and his British Invasion: A Tribute to Mike Smith will be released in March by VDI Entertainment.According to Smith's agent, Margo Lewis of TCI in New York, "These last five years were extremely difficult for Mike. I am incredibly saddened to lose him, his energy and his humor, but I am comforted by the fact that he had the chance to spend his final months and days at home with his loving wife, Charlie, whom he adored, instead of in the hospital, and that he was able to attend a recent concert in London by his good friend, Bruce Springsteen. He was extremely excited and honored to have been inducted into the Rock 'n' Roll Hall of Fame and I am glad that he will be remembered as a "Hall of Famer," because he was in so many ways."